The NVIDIA NVS 810 graphics board delivers exceptional display connectivity, cost-effective scalability, and image management capabilities that make it easy to drive any kind of multi-display digital signage setup. It’s the first of its kind to offer eight display outputs, combined with the world’s most advanced GPU architecture—all in a single-slot form factor. NVS 810 is also ideal for creating dense signage solutions, delivering the uncompromised performance and reliability required to deploy demanding content in mission-critical signage installations. The NVS 810’s dual display engines drive up to eight displays simultaneously and fully supports the next generation Display Port 1.2 standard capable of resolutions such as 4,096 x 2,160 at 30Hz. This configuration of the NVS 810 includes 8 mini-DisplayPort to DVI adapters for customers requiring DVI displays. NVS 810, when used with the nView Desktop Software utility, makes it easy to deploy multiple displays across a desktop or build an expansive digital signage wall. NVS 810’s integrated DisplayPort 1.2 Engine produces phenomenal photorealistic image quality while driving ultra-high-resolution panels (up to 4,096 x 2,160 at 30Hz). NVS 810 also supports advanced Display Port 1.2 features like multi-stream technology (MST) and stream cloning, which enable efficient cable management. MST allows an end-user to drive up to for independent displays simultaneously from any one display port output, while stream cloning enables NVS 810 to clone up-to four instances of each display output to drive a maximum of 32 displays. End users can securely connect to DVI-D SL displays (this configuration PN VCNVS810DVI-PB via the 8 included mDP to DVI-D SL adapters). A DisplayPort option, VCNVS810DP-PB, is also available. Enables seamless taskbar spanning as well as transparent scaling of the desktop and applications across up to 16 displays (using two NVS 810 Graphics Cards) from a single workstation or PC while delivering full performance and image quality. Reduces visible aliasing and delivers higher image quality without the performance hit by harnessing the power of the GPU’s CUDA cores and new film-style AA techniques. NVS 810’s Energy Star compliant design reduces overall system energy costs by intelligently adapting the total power utilization of the graphics subsystem based on the applications being run by the end user. This power-optimized design helps reduce Total Cost of Ownership (TCO) and increase reliability. NVS 810's 4GB of dedicated memory delivers high throughput needed to drive hardware accelerated dual HD Blu-Ray video streams or interact with large textured models on up to 8 ultra-high resolution displays. 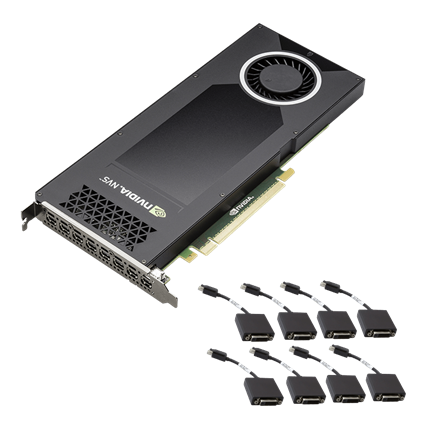 The NVS 810 is the ideal graphics solution to natively drive 8 displays, providing the optimal balance of performance, form factor and power efficiency when compared to dual graphics card configurations. NVS 810 utilizes the latest NVIDIA Maxwell GPU architecture to deliver higher performance and display resolution compared to previous generation NVS solutions without increasing overall power consumption. Enables data transfer rate up to 8 GB/sec per lane for an aggregate bandwidth of 32 GB/sec bi-directional (16 GB/sec in each direction). NVS 810 is tested on industry-leading business applications as well as certified to work in commercial desktop and workstations from multiple PC System Vendors to provide a highly reliable business environment.